The Caledonian Orogeny the name given to the mountain building event that produced the Caledonian Mountains lasted on into the Mid Devonian. The Caledonian Mountains were a huge chain of mountains that were probably Himalayan in height and stretched from what is now Svalbard down the coasts of East Greenland and Western Norway, through the British Isles on to the Appalachians in North America. Whenever a great chain of mountains is thrust up, it will be eroded down and huge thicknesses of sediment can be deposited in sedimentary basins adjacent to the mountain ranges. The Devonian scene in the Fforest Fawr Geopark would have been something like modern day Pakistan, with a huge mountain chain to the north and an arid plain to the south over which rivers periodically flooded depositing sediment. Devonian rocks cover more of the Geopark than rocks of any other age, and all the high peaks in the Geopark, the Black Mountain, Fforest Fawr, and the Brecon Beacons (Fig. 2) are made from Devonian Old Red Sandstone. Many of the rocks are red in colour as the name would suggest. This is due to haematite that formed in these arid conditions. In other places the rocks are green and this is due to a different oxidation state of the iron that may be due to water percolating through the sandstone t a later date. In many places in the Geopark, such as on the slopes of Bannau Sir Gaer on the Black Mountain sedimentary structures such as cross bedding are clearly visible. At a few rare sites such as Heol Senni Quarry fossil fish have also been found. The Devonian is also known for the remains of the planets first forest and in certain places such as near the summit of the Black Mountain, black organic material can be found within the sandstone (Fig 3). Rocks of the lower Devonian are preserved as the St Maughans, Brownstones and Senni formations. These are all sandstones and mudstone. The middle Devonian however is missing, presumably there was a period of erosion after they were deposited removing them before the Upper Devonian Plateau Beds and Grey Grits were lain down. The Plateau Beds are so called because they cap many of the highest peaks in the Geopark. Figure 4 shows the Plateau Beds lying unconformably on the Brownstones. The best places to see Devonian rocks in the Geopark are the walks that climb the high mountain peaks. 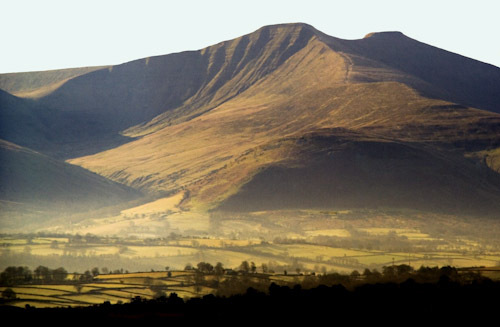 Pen-y-Fan at 886 metres is the highest mountain in southern Britain and the views from the top are magnificent. However it is also a very popular mountain and at certain times of the year can be quiet busy. A wilder and more isolated experience can be had in the west on the peaks of the Black Mountain.